By the 1940s, the various NBC Networks had already established a fifteen-year history of mounting compelling variety, drama and public interest programming as sustaining productions. NBC's numerous color-coded networks had also been whittled down to NBC-Red and NBC-Blue. NBC-Red had routinely been employed for sponsored, commercial programming. NBC-Blue had been the network's broadcast medium for predominately non-commercial, public interest or educational programming. Beginning in December of 1940 NBC-Blue's flagship station WJZ had aired its network-sustained Star-Spangled Theater showcasing original plays and adaptations of Broadway plays featuring famous Stage and Screen artists chosen specifically for each week's production. The selection of performers for each production was also aided by telegrams and letters from its listening audience. The result was a well-received run of thirty-nine productions between December 1940 and September 1941. After Star-Spangled Theater left the air, NBC was presented with something of a dilemma; Star-Spangled Theater had been popular with both the audiences and critics of the era, but had failed to attract a sponsor. This conundrum was not lost on veteran Broadway entertainer, monologist and humorist Walter O'Keefe. The thought occured to him that perhaps a showcase of the previously popular Vaudeville talents of the early 20th Century might better attract a commercial sponsor. Several recent Broadway and off-Broadway Vaudeville productions had proved to be quite popular throughout the late 1930s and early 1940s. The perfect opportunity presented itself when Fleischman Yeast agreed to sponsor O'Keefe's project as a Summer 1942 replacement for Fleischman's popular Edgar Bergen and Charlie McCarthy Show. Vaudeville's comeback on the stage is to be matched by radio with a new show starring Walter O'Keefe, Broadway hillbilly, as master of ceremonies, featuring Raymond Paige's orchestra and presenting a new bill weekly. The new program, title to be announced, replaces the WEAF Charlie McCarthy show for the summer at 8 p.m. Sunday. Top acts from the forthcoming Irving Berlin musical show "This Is the Army," make up the bill for the premiere broadcast. That show, which stars Ezra Stone, has a cast of 300, and is scheduled for a four weeks run at the Broadway theatre, opening July 4. O'Keefe has been drafted form one of the two big vaudeville shows now running on Broadway, "Topnotchers". O'Keefe is master of ceremonies of that show, which presents among others, Gracie Fields, Think-a-drink Hoffman and The Hartmans. Broadwayites are watching with eager interest the new "Star Spangled Vaudeville" program which Walter O'Keefe emcees over NBC Sunday nights at 8 p. m. EWT. They figure that the program's success will open the field to similar ventures by other sponsors and a rush of vaudeville to the microphones would mean more work for them. O'Keefe is currently combing the files of two-a-day headliners and before the summer is over he expects that he will have brought to radio practically every footlight performer who has ever earned an encore at the Palace theater, once the goal of every ham. "Star Spangled Vaudeville" is the first such attempt in a network evening hour. The only ether program which ventured forth in a pattern akin to the O'Keefe stanzas was the Saturday morning Vaudeville theater which is now off the air. Replacing the regular Charlie McCarthy Show is a new feature, Star Spangled Vaudeville, starring Walter O'Keefe, which will be presented for the first time over WIBA at 7 tonight. 8 :00-WEAF-Star-Spangled Vaudeville--Walter O'Keefe, Paige Orchestra: Scenes From "This Is the Army"
7:00 p.m.--WMAQ--Star Spangled Vaudeville, with Walter O'Keefe, M.C., and Raymond Paige's music. Guests: Gracie Fields, Larry Adler, Jack Pearl, and Johnny Burke. 7 p.m.--Star-Spangled Vaudeville (WIBA): Andrews sisters, Phil Baker, Raymond Paige orchestra, others. 7 p.m.--Star-Spangled Vaudeville (WIBA): features Olsen and Johnson. 7 p.m.--Star-Spangled Vaudeville (WIBA): guest stars, Burns and Allen, Cardinal baseball battery, Mortan and Walker Cooper. WEAF At 8 P. M.
Star baseball players pitching in with a comedy script; George Burns and Gracie Allen lured away for a day from vacation by the great idea of radio's revival of vaudeville; the Ink Spots, and Charlie Magnante, Manhattan's popular accordionist, make up the bright-light bill of "Star Spangled Vaudeville" for Sunday at 8:00 p. in. 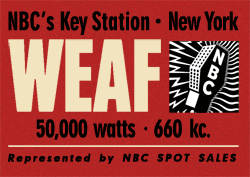 over WEAF. Morton and Walker Cooper, brother battery of the St. Louis Cardinals, give and take with the specially humor written in a for skit this show. Morton, best-loved of sports page pitchers, and Walker, catching, intend to strike out Master-of-Ceremonies Walter O'Keefe in an act that is far afield for them. 7 p.m.--Star-Spangled Vaudeville (WIBA): Willie Howard, Sidney Fields, Carol Bruce, Herb Shriner, Walter O'Keefe. 7 p.m.--Star-Spangled Vaudeville (WIBA): stars Al Jolson, Alec Templeton, and Block and Sully. Block and Sully, veterans of the two-a-day vaudeville era which saw them, Jack Benny and Burns and Allen in their footlight glory, are the latest headliners to be booked for the "Star Spangled Vaudeville" program Sunday at 8 p.m. over WEAF. They'll be in fast company, sharing honors with Al Jolson, returning from a tour of overseas bases, and Alec Templeton, the famed blind pianist and satirist. Walter O'Keefe is emcee and music is batoned by Raymond Paige. 7 p.m.--Star-Spangled Vaudeville (WIBA): Eddie Cantor, Linda Ware, and others. 7 p.m.--Star-Spangled Vaudeville (WIBA): Morton Downey, Shirley Booth, Pic and Pat, Nan Ray, and Mrs. Waterfall. Charlie McCarthy and his company of veteran henchmen will being their program back to the airwaves at 7 tonight over WIBA.